The saturated fat was not included just a % sign. Does that mean 0. How does this work out for the new Weight Watcher plan, the chicken should be 0 points. Just a thought, I love your recipes, I just need clarification on this one. Thanks so much, happy holidays. This has been updated with freestyle! The calculator would not be accurate with all the new 0 point foods, you have to use recipe builder. Pingback: 8 Low-Carb ImPASTAs, 40 InSPIRALized Recipes - Noom Inc. | Noom Inc. 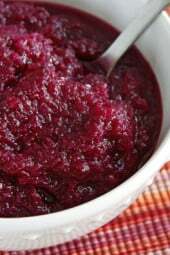 This recipe is a weekly favorite! Yum!!!! I have made this a few times and it does not disappoint. I use Pinty’s chicken flings! I’ve been trying to like spaghetti squash for years but always find it somewhat disappointing. This recipe is the first time I made spaghetti squash and didn’t end up staring longingly across the table at my children’s pasta! Yum! I made this last night and it was fantastic. I’ve also prepped enough for dinner all week. I’ll be making more from this site for sure. Used sausage, added fried onion & garlic, 3X the sauce & 2X the cheese. Made surface cuts in the 1/2'd squash, then rubbed in: refined coconut oil, salt, pepper, onion & garlic seasonings-baked "up" for 20 minutes then turned down for the remaining 40 minutes. Delicious! I know this comment is waaaay late, but I just made this tonight and LOVED it. I recently discovered your site after making a commitment to getting more healthy, and I'm so glad I did! What can I say, another meal my entire family enjoyed! I tried making a dish with spaghetti squash years ago, but the recipe had me microwave the squash uncut and it just didn't come out well. So I never tried it again until now. So glad I did! Thanks again Gina for all the great recipes and for taking the time to post them with photos and such specific instructions! Just ordered a spiralizer the other day, can't wait to get it and try your asian meatballs over zoodles, mmmmm good. Wow – this recipe is amazing! Tried it last night and even the hubby loved it!! Thank you! Quick Question. I have had Bypass surgery back in Dec and I have been making this, Obviously I don't eat a lot at a time, however can the Leftovers be frozen and reheated later (like scrapped out of the "boat" and place in Tupperware into freezer???? I made this for dinner tonight. Wow. Hubby thought it was awesome. Honestly, I could only eat 1/2 boat, but I probably used more than 3 oz of chicken on each one. I made the marinara with onions, garlic, mushrooms, tomatoes and tomato sauce and seasonings. This really was amazing. Hubby will eat my leftovers tomorrow for lunch!! We made this for dinner today, and it was a hit! It took longer to roast the squash, but we really enjoyed it. Will make again. I've made this a few times, and have enjoyed it each time. I've discovered that it's important to make sure the strands are no longer attached to the sides of the squash, or it can be a little difficult to eat. So yummy, though! I'm sure I'll make it again. I made this last night and it was FANTASTIC! So tasty and easy to pull together. I shared the deliciousness with my readers here: http://seektobemerry.blogspot.com/2013/09/shakin-things-up-in-kitchen.html Thanks for the inspiration! The whole family loved this! Everyone scraped their boats clean. I forgot to buy the mozzarella so we just sprinkled some grated parmesan on top. Yum! Good lord this was good. Spaghetti squash is one of my favorite vegetables but since I'm always eating it, I'm always looking for new ways to cook it. I saw this, had all the ingredients and decided to try it. I was really hungry so I nuked my squash instead of roasting – it worked fine and was delicious, but I think next time I'll roast it just to get that extra layer of flavor. Since everything was so light I used fresh, whole milk mozzarella. I could eat this every day. I was so happy that my husband had to go into work and wasn't able to eat with me – it meant I got to bring leftovers to work for lunch the next day! So good. I'll make this over and over, especially now that squash season is almost here and spaghetti squash will be everywhere. I love how I can adapt most of your recipes for two people instead of 6 servings. I'm going to make these next week. With pasta instead of squash for my husband. So I'll just get one boat for lunch the next day, ha! Thanks for another yummy recipe! I used this as an idea but also kind of a base recipe. I have been really wanting to try spaghetti squash since my friend Jeff was on season 14 of the biggest loser and Jackson who was also on the show was obsessed with it. 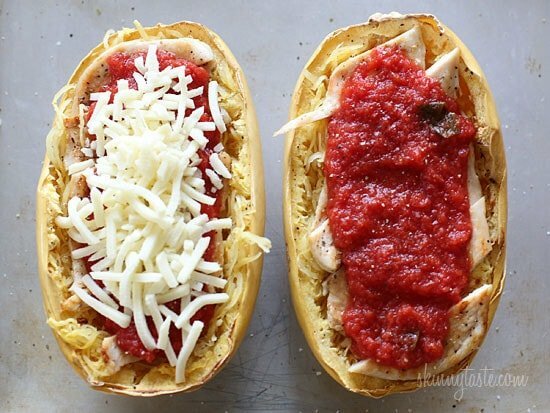 I ended up making spaghetti squash boats with grilled chicken parmesan. I turned my oven up to 400º because I looked at a lot of recipes abd they all either said 350º or 450º for an hour so I figured I would go ib the middle. The squash was perfect after an hour. 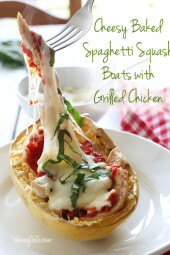 I used my grilled chicken parmesan recipe cut up the chicken put it in the squash boats and put back in the oven and out came something amazing! My 11 year old loved it and asked if I would nake it all the time now. Thanks for the great idea and good first experience with the spaghetti squash! This came out really well! We used my husband's spaghetti sauce and we used brined chicken cooked on the grill. Oh man alive! So yummy. Only negative thing: my husband somehow hit himself in the eye with a string of melty cheese. lol I don't know how he did that, but I told him it HAD to go in the comment. Thanks Gina! Just a heads up: I put your nutritional calculations in my WW app & it is 8 Points+, not 6. Otherwise, WONDERFUL!! These were delicious and VERY filling! We also tried it with fresh raw baby spinach on top. We will definitely add this to our never ending list of skinny taste loves! These were so incredible that I almost couldn't take it. By far one of the best dishes I have ever made. I don't have a grill, so instead I breaded chicken breasts and baked them in the oven and used those. While it was baking, I made the squash in the microwave. I was reluctant to use the microwave because I never have before, but the squash came out perfect. Would HIGHLY recommend this recipe. Yum yum yum. I made this Sunday…halved the recipe. It was delicious!! I had never had spaghetti squash before. I brought the second half to work for my lunch on Monday. Heated up very well. I will definitely make this again. I have made several of your recipes and have loved them all. Thank you for sharing! Thanks for sharing the freezing tip! I LOVE meals where I can double the recipe and freeze half for another meal! Another great recipe Gina, thank you! I made this recipe about a month ago for my husband and I. There were 2 halves left so I took the chancce qnd froze it. I took it out today thawed it and heated it in a 350 oven. It was as good as the first time we had it. I love making 2 meals at once. I made this recipe, but the spaghetti squash was slightly "crunchy". Has anyone else had this problem?? I would try cooking it upside down in water (like an inch of water in the bottom of the pan). That should help, and also cook it for a little longer. When I pulled just the squash out of the oven the first time it was a little crunchy so I stuck it back in for 10 more minutes and then it was perfect. Good luck! I have been cooking spaghetti squash for the past couple of years. I cut them in half, rubs them with olive oil and cover them with sea salt, fresh ground pepper and Italian seasoning and bake them like you. The idea of making them similar to a twice baked potato is so cool!!!!! I could not use the squash shell so I improvised and used crab imperial dishes, which have handles. The sauce, I included 2 Serrano peppers finely chopped, a cup of fresh chopped green peppers, a cup of fresh chopped green onions, 4 cloves of garlic, 3/4 cup of fresh basil,1/4 cup of fresh cilantro, 2 tablespoons of Italian seasoning, sauteing them and then adding a 14oz jar of Marianna sauce. I used hot peppered mozzarella cheese instead, put the filled imperial dishes on top of white plates and sprinkled parsley flakes all over the white imperial dish sitting on top of the white plate. The presentation was so cool but the dish was GREAT!!!!! It was a smash!!!!!! WOW!!!!! Thank you so much, what a GREAT, FUN,UNIQUE, NEW and exciting idea!!!!!! OH MY GOSH!!!! I just made these for dinner tonight and they were amazing!!! Such an easy and filling dinner on a yucky Friday night. And I'm STUFFED! I tried this last night for a change of pace and yummm!! Even my 20 month old pasta addict daughter gobbled up alomst one boat!! 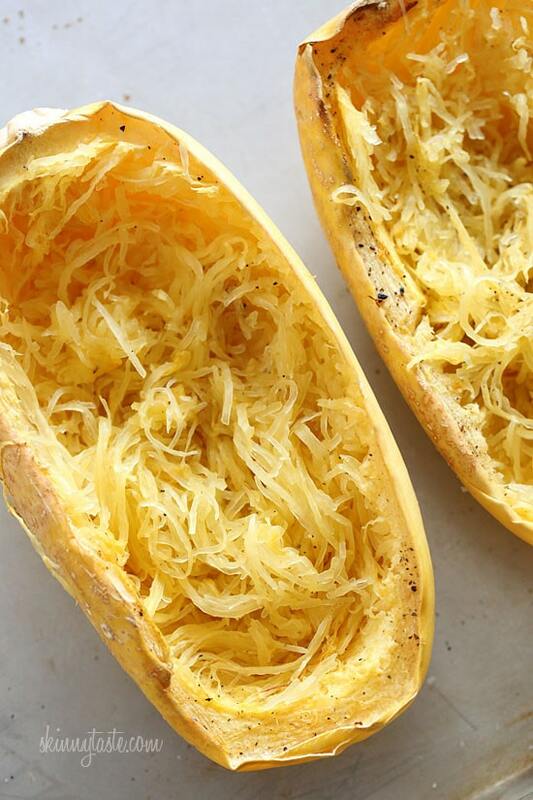 Thank you for introducing us to spaghetti squash! My husband and I L.O.V.E.D. this recipe! Not only did I impress him with the neat presentation, but he could not stop raving to our friends about how good this tasted. (Made me feel like a great cook!) We have added this to our top 5 recipes EVER. Your Baked Spaghetti Squash & Cheese recipe is in the oven right now, which I have no doubt we will love just as much. Thank you so much for the precision in your recipes. It makes someone like me feel like I'm actually a good cook, while at the same time helping us lose weight! Just made this for dinner and the whole family loved it. Do you think it could be made ahead and frozen??? I just made this and it was fantastic. I'm on a low cal diet and this was a filling and tasty dinner. I can't wait to have it again and make it for my husband. Thanks! I finally had a chance to make this last night and WOW…delish!!! I didn't roast the squash (not enough time) but the microwave worked just fine. Who needs pasta???? This will def be in the rotation and really helped with my chicken parm craving. THANKS! 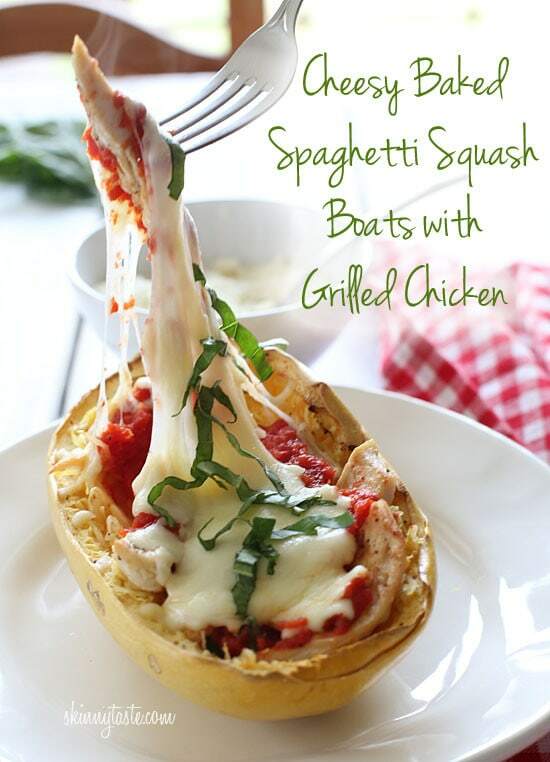 I have never tried/cooked with spaghetti squash but I tried this recipe tonight and it was ah-mazing!! definitely making it again! I have made this twice since finding this! It is delicious! I add spinach in with the chicken while cooking – a little extra veggie thrown in there! Thanks, Gina! Made this for dinner tonight, it was fantastic! Thanks so much for sharing this recipe, and all of them! I just made this for dinner… wasn't sure what to expect but it came out amazing! I'll totally make this dish again. This was amazing.. thank you! Just made this and it was SO delicious and satisfying. Thanks for the delicious recipes!! This was amazing! 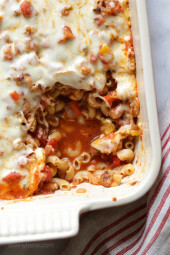 So easy and even better left over the next day! I cooked this last night and it was amazing!! First time that I have ever had spaghetti squash and it will not be the last. Instead of chicken I put put in mushrooms and onions into the marinara sauce, so not sure what that did to the points, but I wanted a veggie meal only. I only made one squash ate half last night and reheated the other half today. It was just as good today as it was yesterday! Mmmmm had this for dinner tonight with a breaded chicken thigh. Soooo good! This was amazing, I made it with hubbard squash because its what I had on hand, but I also used your skinny pesto to dress up the chicken, tossed in some mushrooms with the marinade and added broiled tomato slices on top. It was simply divine my new way to eat mock-pasta since it's unprocessed but still gives the same delicious effect! Very creative, thank you! I made this last night it was wonderful and so easy to make! My kids loved the squash and no leftovers! I am so glad I found your website! 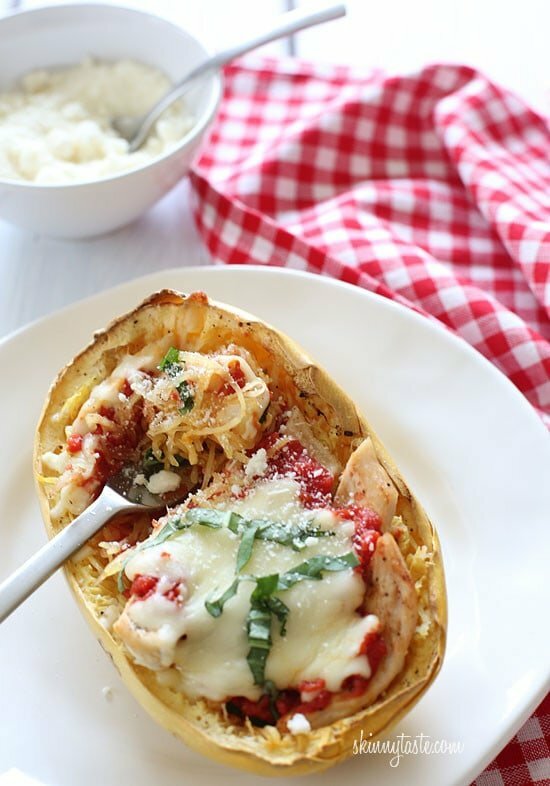 Loooooove spaghetti squash and this recipe sounds amazing!! If it's just me, can I freeze/reheat the other 3 halves? Or is it better to just scoop out the "insides" and freeze them and toss the shells? I had never eaten spaghetti squash until I saw your amazing recipe for this during the first week of January. The picture made it look so delicious, so I decided to try it, and it was a hit! My 5 year old son even enjoyed it. Thanks Gina for your wonderful recipes; you don't disappoint! This was absolutely delicious….as are all of your recipes Gina – thanks so much! This dish is yum but takes a little time. I suggest microwaving the squash for eight minutes and in oven for twenty minutes. I try to eat South Beach style and winter squash/Spegetti squash have a ton of carbs. 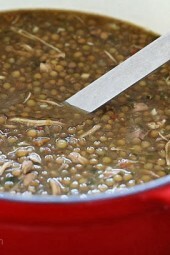 I suggest this dish for a mid day meal not for dinner. For a quick red sauce Prego vegie smart is a good choice. I only used one cup of sauce. Ha, I made this the other day for myself and my boyfriend, but my store only had enormous spaghetti squash. We ended up splitting half a squash, and we're having the other half for dinner tonight! It was delicious though, thank you!